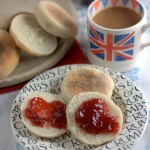 Ever since Ed went on his bread course he has taken on the bread responsibility in the Fuss Free kitchen; his latest endeavour were English Muffins which we had never made and were eager to try. English muffins are really surprisingly simple: a straightforward dough made with milk rather than water, and cooked on a skillet. Serve these hot from the oven, or toasted with butter and jam (or Marmite) with a perfect cup of tea! 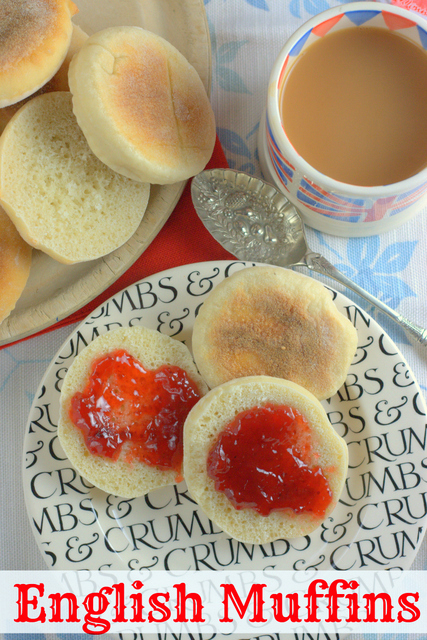 If you try this Recipe: (Ed Bakes) English Muffins please tag #FussFreeFlavours on Instagram or Twitter. It is amazing for me when for me when you make one of my recipes and I really do love to see them. You can also share it on my Facebook page. Please pin this recipe to Pinterest too! Thanks for reading Fuss Free Flavours! I used dried yeast, rather than quick yeast, so activated it in the milk with a teaspoon of sugar for a few minutes before mixing all the ingredients together, and kneading until I had a smooth dough. Leave to rise for three quarters of an hour or so, and then roll out to about 1cm thickness. I used fluted pastry cutters to cut 3? (7.5cm) circles (because that’s what I had), but think that the twisting motion when cutting slightly sealed the edges , so next time I’m going to try dividing the dough into 6 or 8 equal portions, rolling them into balls and then flattening the balls out into muffin shapes. Place the muffins on a floured baking sheet and let them prove for half an hour. To cook, heat a heavy frying pan – if you have a flat griddle use that – and cook them for five minutes on each side. Once the frying pan was hot, it only needed a very low heat to keep at the right temperature to cook the muffins – about five minutes is perfect, as it allows them time to rise properly, but not so long that they dry out. Once cooked, allow to cool and run a knife around the edge. Split in half and toast; perfect with lashings of butter and jam!